Two weeks into Colorado’s mail-back ballot and seven days until the election, a third of the vote is in, assuming a turnout of 2.5 million (see The Buzz: Midterm Voting Starts, Record Turnout Expected). Republican and Democratic returns are keeping apace: 281,000 Republican and 280,000 Democrats, or 35 percent each, with 29 percent of returns from unaffiliated voters. Jefferson County with 105,000 votes in has the largest early numbers among counties in the state (reflecting the two hard-fought State Senate races), leading El Paso, a larger county that has 93,000. In the Denver metro area, Arapahoe and Jefferson have a few more Democrats returning ballots than Republicans. 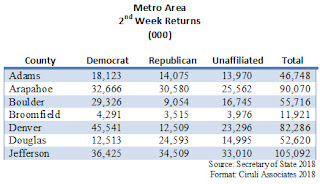 Jefferson with its 33,000 unaffiliated early returns is the statewide record. Denver voters turn in ballots late. Arapahoe’s high vote early turnout reflects the intense congressional race. 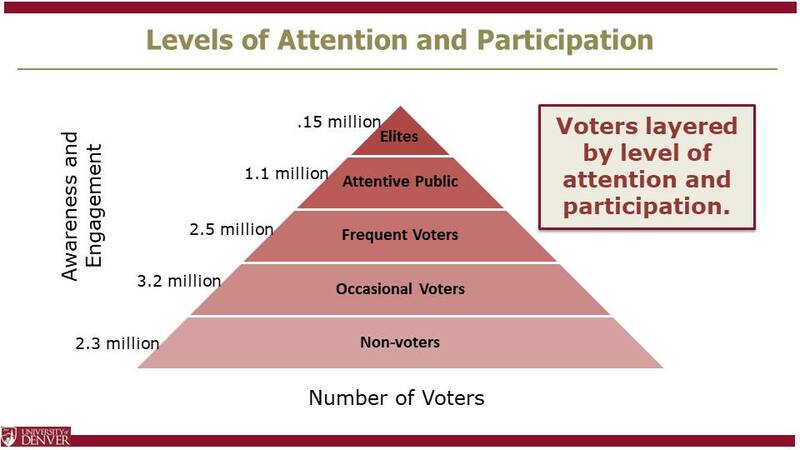 The Voter Pyramid below shows likely voter turnout, given the level of awareness and engagement in the political process. There are 3.2 million residents currently registered to vote. About 2.3 million Coloradans are non-voters; for example, if they haven’t registered or are too young. Voters are most engaged in a presidential race, which in Colorado in 2016 saw 2.85 million voters cast ballots in the presidential race. This year, about 1,140,000 voted in the June primary election, including a significant turnout from unaffiliated voters encouraged to vote for the first time. It represented an increase of 500,000 from the 2016 primary vote. One hundred and thirty-four thousand more voters selected a Democrat rather than a Republican gubernatorial primary candidate. The primary voters are labeled in the triangle as “attentive voters.” They are more interested in politics and motivated to participate. “Elites” are the civic, business and political activists that tend to dominate the political process. In Colorado, they are more likely to participate in a party caucus, contribute to a campaign, and attend a candidate or issue event. I read this blog, therefore I is an elite!